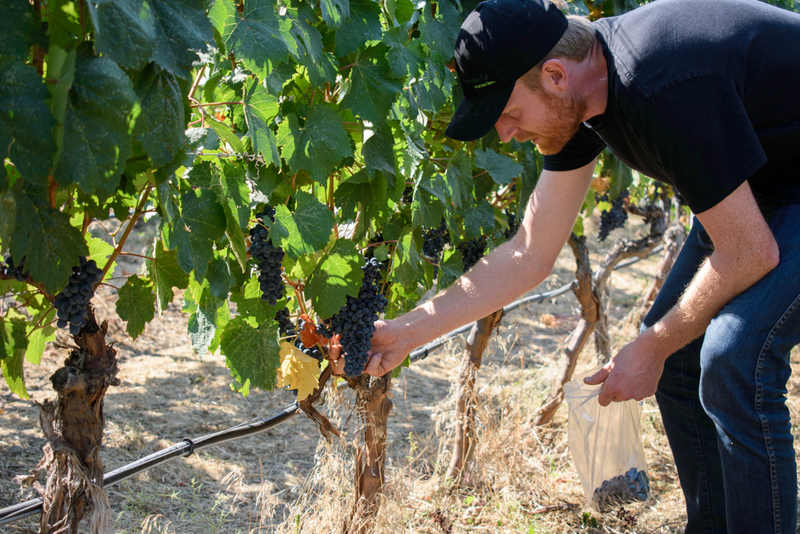 Last week, we started taking berry samples from Phantom Creek and Sundial Vineyards. Each vineyard block is sampled individually. Even for the same grape variety, some blocks will ripen earlier than others. The fruit’s maturity will depend on the block’s unique mesoclimate as well as the clone and rootstock. Precise sampling allows us to harvest each block at its optimal ripeness. 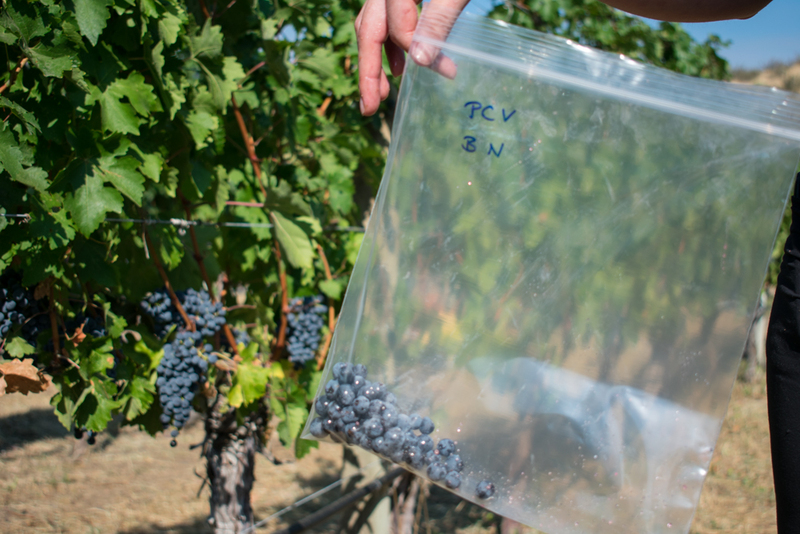 The key is making sure the Ziplock bag full of berries is a representative sample of a vineyard block that may be several acres in size. To this end, berries are individually picked from different parts of the grape cluster. Berries that are sun exposed will be sweeter than those that are more shaded; the top of the cluster will always be more mature than the tail. The range of maturity within a cluster may be up to 1 to 2 weeks. Consequently, berries are selectively taken from the front, back, top, middle, and bottom of different clusters. We’ll run the numbers on each block, specifically looking at sugar ripeness (measured in Brix), pH, and total acidity. Samples are taken once a week to begin with to monitor a block’s development. We also have the benefit of using phenolic analyses. 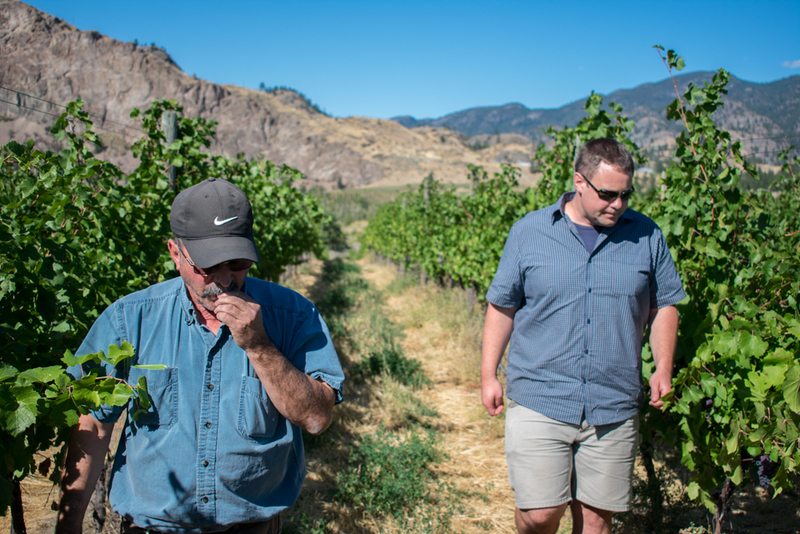 As the block gets closer to optimal ripeness, the frequency of samples will increase and John and Ross will taste the fruit on an ongoing basis. The difference between underripe and overripe is often a narrow window. John and Ross will also keep an eye on the upcoming weather forecast. A heatwave, like occurred recently in Napa, or unseasonable rain may move the harvest date forward. Optimal ripeness cannot be considered in isolation; it’s also relative to the vintage. As the Pinot Noir and Chardonnay for our inaugural sparkling wine starts fermenting at the winery, Ross and John are tasting Pinot Gris berries to determine when they should be picked. These rows in Okanagan Falls are tasting like they’ll be ready to be picked this week.